The Agricultural Producers Association of Saskatchewan requires an Assistant General Manager to join our team and help continue to grow and engage our membership. 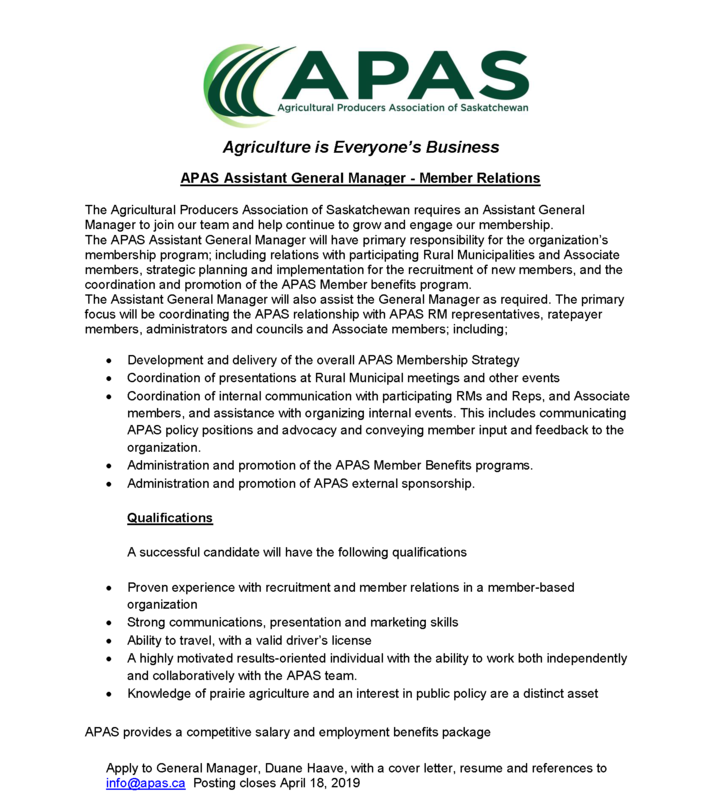 The APAS Assistant General Manager will have primary responsibility for the organization’s membership program; including relations with participating Rural Municipalities and Associate members, strategic planning and implementation for the recruitment of new members, and the coordination and promotion of the APAS Member benefits program. • Coordination of internal communication with participating RMs and Reps, and Associate members, and assistance with organizing internal events. This includes communicating APAS policy positions and advocacy and conveying member input and feedback to the organization. • Administration and promotion of the APAS Member Benefits programs. • Administration and promotion of APAS external sponsorship. • A highly motivated results-oriented individual with the ability to work both independently and collaboratively with the APAS team. Apply to General Manager, Duane Haave, with a cover letter, resume, and references to info@apas.ca. Posting closes April 18, 2019.